In the 1860's the Italians began to appear, the first little group arriving as early as 1866 and probably earlier. They did the work of laborers, the Germans and Irish, had done before them, and a goodly proportion of them are still doing it, although now forced to share it with Russians, Poles, Romanians and other more or less kindred races; the Hungarians, and latterly the Greeks. History is forever repeating herself. When the Irish and then the Germans first came to Newark they were looked upon with something akin to distrust by the descendants of the Puritan founders. The Italians were received in much the same way by those already on the ground, and much the same process of amalgamation was begun all over again. The Italians have had much to learn, and the born-and-bred Newarkers have come gradually to change their view concerning the Italians. The latter often come from sections of Italy where they and their people for generations have been forced to live lives almost diametrically opposed to all that we of these United States consider essential to good citizenship. They have had much to unlearn, and the native-0born have not always exercised the proper forbearance. Today (1913), however, Newark has many Italian citizens of sterling respectability, who in the passing of the years are growing to understand true Americanism, and who in turn are coming to be better understood. The public schools are now a powerful factor in the Americanization of the children of the Italian immigrants. Another force, whose breadth and potency is as yet but indifferently appreciated is that of the city playgrounds. In the playgrounds and schools many young Italian-Americans are rapidly grasping the true essentials of good citizenship. Newark now has many Italian residents of means, and many who are destined to take an active and praiseworthy part in the advancement of the city in the immediate future. It is impossible to tell when the first Italian immigrants took up their abode in Newark. Some who came here as early as 1870 and 1871 tell of a family of the name of Catalana that had been residents of Newark for some time before. The Newark Directory for the year 1864-1865 contains the name of one Angelo Cattaneo, a hatter, who lived at 282 Mulberry street. When a family of the name of Genelle came to Newark in 1870 it found a number of Italian peanut venders and others, and one or more families whose members spoke English fluently, indicating that they had been residents of this country for several years. 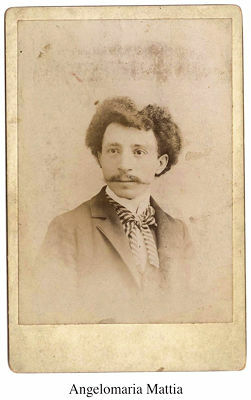 The oldest living Italian-born resident of Newark in 1913 was believed to be Angelo Maria Mattia, who came to this city in 1871. It was late in the 1870s before Italian immigration found its way to Newark in any volume, and it was not until nearly a decade later that it assumed anything like its present proportions.